You will need the RealPlayer plug-in to play some of these clips. 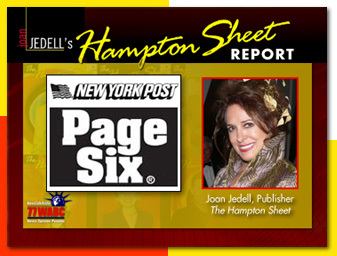 September 6, 2011-- Regis Philbin talks about Hampton Sheet's 15th Anniversary issue on Live! With Regis and Kelly. Watch here. March 30, 2010--Joan Jedell on Fox 5 News talks about the Report that Sandra Bullock May Be 'Ending the Marriage'. Watch here. January 10, 2010--Joan Jedell on Geraldo At Large talks about Casey Johnson's wild life and her death. Watch here. 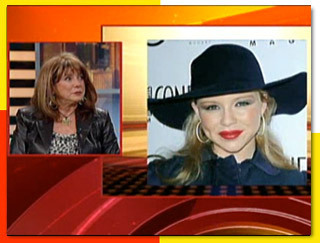 January 9, 2010--Joan Jedell on CBS talks about Casey Johnson's death. Watch here. January 6, 2010-- Joan Jedell talks about Casey Johnson's untimely death on FOX 5. Watch here. January 5, 2010--Joan Jedell on CBS talks about Casey Johnson's death. Watch here. January 5, 2010--Joan Jedell talks about Casey Johnson's untimely death on Access Hollywood. Watch here. January 5, 2010--Joan Jedell talks about Casey Johnson's untimely death on FOX 5. Watch here. 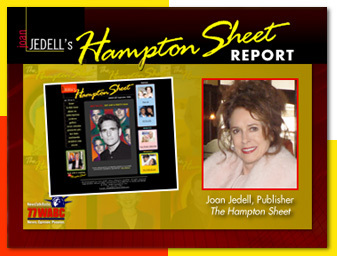 SEPTEMBER 2, 2006--Joan Jedell delivers the "Hampton Sheet Report" with WABC Radio's Mark Simone. Click here to listen! (Clip courtesy WABC Radio 77 New York). 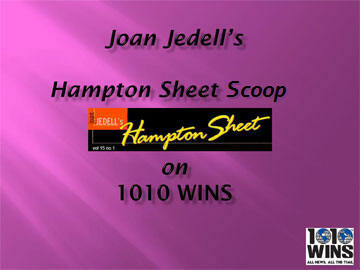 AUGUST 26, 2006--Listen to Joan Jedell serve Hamptons dish in this week's "Hampton Sheet Report" with WABC Radio's Mark Simone. Click here to listen! (Clip courtesy WABC Radio 77 New York). 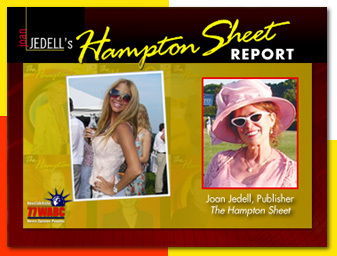 AUGUST 19, 2006--Joan Jedell reports on the "scandalous Hamptons" in this week's "Hampton Sheet Report" with WABC Radio's Mark Simone. Click here to listen! (Clip courtesy WABC Radio 77 New York). 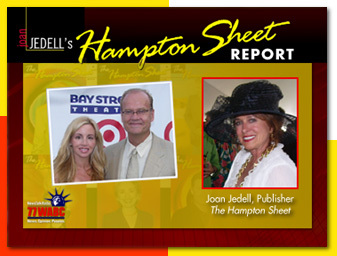 AUGUST 12, 2006--Joan Jedell brings us the buzz in this week's "Hampton Sheet Report" with WABC Radio's Mark Simone. Click here to listen! (Clip courtesy WABC Radio 77 New York). 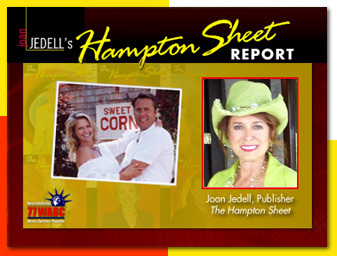 AUGUST 5, 2006--Joan Jedell serves up the Hamptons' dish in this week's "Hampton Sheet Report" with WABC Radio's Mark Simone. Click here to listen! (Clip courtesy WABC Radio 77 New York). 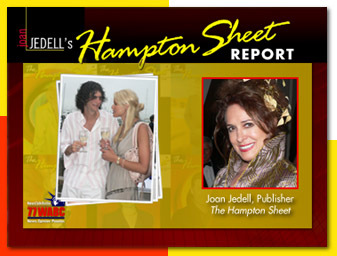 JULY 29, 2006--Joan Jedell talks about the goings-on in the Hamptons in this week's "Hampton Sheet Report" with WABC Radio's Mark Simone. Click here to listen! (Clip courtesy WABC Radio 77 New York). 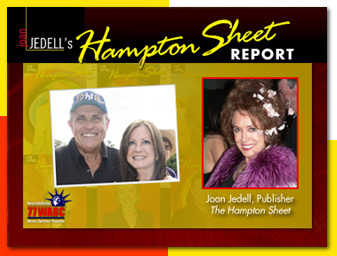 JULY 22, 2006--Joan Jedell dishes up the latest on the Peter Cook cheating scandal in this week's "Hampton Sheet Report" with WABC Radio's Mark Simone. Click here to listen! (Clip courtesy WABC Radio 77 New York). 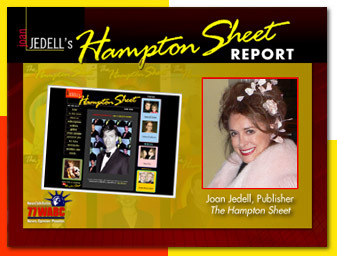 JUNE 24, 2006--Joan Jedell on the latest from Manhattan and the Hamptons with the weekly "Hampton Sheet Report" with WABC Radio's Mark Simone. Click here to listen! (Clip courtesy WABC Radio 77 New York). 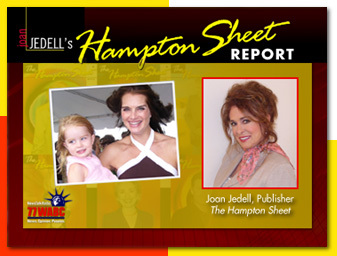 JUNE 17, 2006--Joan Jedell delivers the buzz from the Hamptons and New York City in the "Hampton Sheet Report" with WABC Radio's Mark Simone. Click here to listen! (Clip courtesy WABC Radio 77 New York). 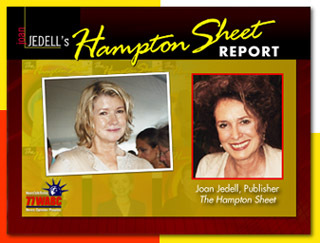 JUNE 10, 2006--Joan Jedell serves up the dish with WABC Radio's Mark Simone in this week's "Hampton Sheet Report." Click here to listen! (Clip courtesy WABC Radio 77 New York). 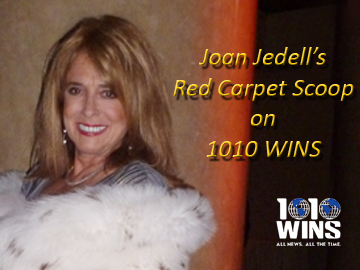 Hear Joan dish out the latest Hamptons happenings every Saturday morning at 9:20am on 77 WABC! 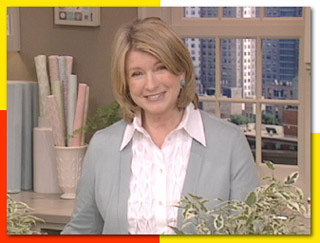 JULY 17, 2004--Joan Jedell tells all about Martha Stewart's reaction to her recent sentencing in this week's "Hampton Sheet Report" with WABC Radio's Mark Simone. Click here to listen! 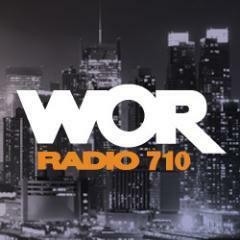 (Clip courtesy WABC Radio 77 New York). You will need the RealPlayer plug-in to play this video clip.